“Guardians of the Galaxy” may not be generating Oscar buzz, but it is the unquestioned winner of the 2014 box office race. The movie grossed nearly $332 million domestically during a long theatrical run, overcoming a number of perceived hurdles. Although “Guardians” is a Marvel Comics property, it lacks the name recognition of staple heroes, like “Spider-Man,” “Iron Man” and “Captain America.” It also relegates its most marketable stars (Bradley Cooper and Vin Diesel) to roles where their faces are hidden. Ultimately, the perceived marketing issues don’t matter because the movie – a wild mix of comedy and science-fiction – is a blast, and theatrical audiences figured that out right away. The home video release should only add to the movie’s popularity. The action centers on a human named Peter Quill (Chris Pratt) who was kidnapped by space pirates when just a boy. Having learned the ways of his captors, Quill is a swashbuckling shyster who runs into trouble after stealing a mysterious and powerful orb. 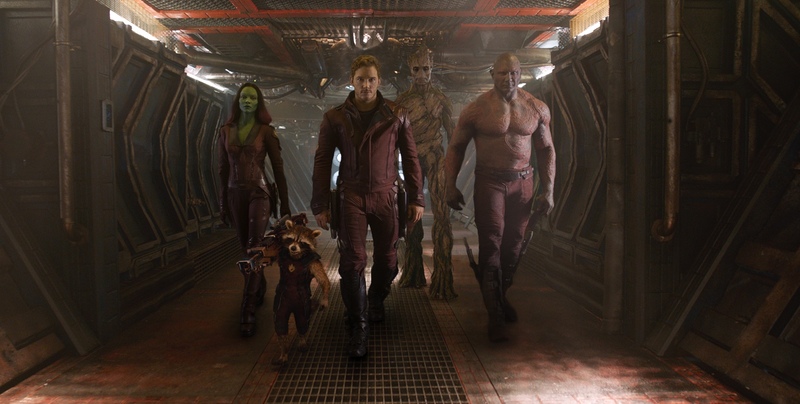 Before he can sell the item, he is attacked by an assassin named Gamora (Zoe Saldana), and he attracts the attention of two alien bounty hunters, a tree-like figure called Groot (Diesel) and a gun-wielding raccoon named Rocket (Cooper). All four of them are arrested after a raucous public fight, and they land in jail. While inside, they work with a heavily-muscled fellow prisoner named Drax (Dave Bautista) to escape, and they decide to team up and sell the orb together. As the film marches forward, it becomes the story of an unlikely group of adventurers who learn that they have more in common than they first assumed. It also becomes a tale of heroism, as the largely self-centered characters learn to put their own interests aside for the greater good of the galaxy. Like most science-fiction films, “Guardians” is a special-effects spectacular, and co-writer and director James Gunn (“Super”) transports viewers to exotic locales while introducing them to a collection of wonderful characters. The action scenes are plentiful and well staged, but “Guardians” sets itself apart by infusing its intelligent script with heavy doses of humor. Pratt – seen in “Delivery Man,” “Her” and “The Five-Year Engagement” – has always been a likable screen presence, but here he becomes a full-fledged star. As Quill (who affectionately calls himself Star-Lord), Pratt is one part action hero and one part stand-up comic; the combination is terrific. The remaining cast is strong as well. There’s a lot going on in “Guardians,” and Gunn mixes his ingredients perfectly, creating a peculiar and wonderful stew that starts fast and finishes strong. On paper, the idea of a sequel to the 2011 hit “Dolphin Tale” seemed terrible. The original movie was based on the extraordinary real-life story of Winter, a rescued dolphin who lost her tail after getting tangled in the ropes of a crab trap. Since the original movie covered everything from Winter’s rescue to rehabilitation, sequel fodder seemed minimal. As it turns out, the Clearwater Marine Aquarium (Winter’s home) has more than one amazing story to tell, and “Dolphin Tale 2” serves as a conduit. For the sequel, the focus is again on Winter, but the struggle is no longer her missing tail. The movie begins with the death of the dolphin that Winter was paired with, an event that sends her into a deep depression. Since companionship is crucial to a dolphin’s health, the aquarium employees must find a solution or risk losing Winter to regulatory authorities. The answer seems to come in the form of a newly rescued dolphin named Hope, but not all marine mammals are guaranteed to bond, so there’s plenty of drama along the way. As with the original film, “Dolphin Tale 2” blends fact with fiction, focusing not only on the dolphins but the mostly fictional human characters that are said to care for them. All the major players from the first film are back, including aquarium head Clay Haskett (Harry Connick Jr.), Clay’s daughter Hazel (Cozi Zuehlsdorff), aquarium volunteer Sawyer Nelson (Nathan Gamble) and Winter’s prosthetic designer Cameron McCarthy (Morgan Freeman). The film has a number of subplots, most importantly one where Sawyer must decide whether to pursue a wonderful academic opportunity or stay behind to sort things out with Winter. It is also clear that Hazel is developing romantic feelings for Sawyer, but he seems largely oblivious. As with the first movie, “Dolphin Tale 2” is a sweet, PG-rated drama that is suitable for all ages. There is nothing extraordinary in the plotting or presentation, but returning director Charles Martin Smith keeps the pacing fast and assures a pleasant viewing experience. The result is a surprising sequel that nearly matches its original in both quality and entertainment value. Blu-ray and DVD extras include a feature about the true story that inspired the film. Good journalists have a healthy respect for facts, realizing that reality is often more compelling than fiction. Hollywood has never shared this sentiment, so even real-life stories are heavily massaged for the screen. They are more tightly focused, more self-aware and – in the case of “When the Game Stands Tall” – more melodramatic. Oddly, the most heavily fictionalized moments in “Game” are its most troubling, and this creates an odd dynamic where the film succeeds despite the filmmakers’ best attempts to derail it. The movie begins in late 2003 with De La Salle High School in Concord, Calif., winning a historic 151st consecutive varsity football game. That part of the story is real, as is the fact that De La Salle lost its next game and played its entire 2004 season beneath the shadow of coach Bob Ladouceur’s off-season heart attack and the death of former star Terrance “T.K.” Kelly. With all this drama on the table, director Thomas Carter and screenwriter Scott Marshall Smith could have made a darn good feature by sticking to the facts. Nevertheless, they twisted timelines and manufactured composite characters, thus damaging the project’s historical accuracy and making it sappier than needed. The movie was inspired by writer Neil Hayes’ non-fiction book, which shares its unfortunate title with the film. Games do not stand – tall or otherwise – and it would have made sense for Carter and Smith to name the film more appropriately. Alas, they kept the silly name while ignoring interesting facts, like the times and places of key matches. Notably, the film devotes considerable time to De La Salle’s historic, 2001 victory over Long Beach Polytechnic High School. The trouble is, the game is shown as the turning point of De La Salle’s rocky 2004 season, not as an impressive victory during the school’s long-running win streak. In the movie, the De La Salle Spartans start the 2004 season 0-2 before righting the ship with a close victory over the Southern California powerhouse. In reality, the team won only one of its first five games, then rebounded with an impressive mid-season streak that led to its 13th consecutive section championship. That truth is more dramatic than events portrayed on screen, but the filmmakers somehow missed that. It’s probably because they were busy inventing silly composite characters. The most noteworthy is Chris Ryan (Alexander Ludwig), a dominating, fictional running back who is chasing the California state touchdown record. Chris is depicted as a good kid who subscribes to De La Salle’s team-above-self philosophy, but his father – Mickey (Clancy Brown) – pushes him aggressively toward the record. The idea of the nightmare sports-parent is so pervasive it’s become yawn-worthy, and the Ryan subplot detracts from the film’s more interesting material. It’s also distracting that Carter portrays Ladouceur (Jim Caviezel) as a borderline saint. The coach’s wife (Laura Dern) occasionally berates him for spending too little time with the family, but viewers aren’t privy to her loneliness, and that makes her look like a nag. In the meantime, Ladouceur – played likably by Caviezel – is painted as a selfless spiritual leader who teaches players that winning doesn’t matter … all while piling up an unmatched streak of victories. There is no question that Ladouceur accomplished great things at De La Salle, and his work with student athletes is admirable. Still, no man – no matter how good – is perfect, and “Game” would have been more realistic and more compelling if a few of Ladouceur’s flaws had reached the screen. Despite all its attempts to whitewash reality, “Game” somehow remains enjoyable. Look beyond the clichés and melodramatic nonsense, and one finds an inspiring story about leadership, discipline and the achievements that are possible when people band together. “Game” is also the story of a coach overcoming personal tragedy (a heart attack) and a team moving past the loss of an inspirational friend. Curiously, these are all themes delivered by real life, and one wonders how great “Game” might have been if Carter and company had been satisfied with that. Blu-ray and DVD extras include a behind-the-scenes feature and an audio commentary by Carter. Writer-director John Michael McDonagh (“The Guard”) tackles a fascinating premise in “Calvary,” a dark independent drama about a priest forced to confront his mortality. Brendan Gleeson plays Father James, a holy man who receives a death threat during confession. The good father, who is told he has a week to live, doesn’t know whether to take the warning seriously. Still, it shakes him enough to report it to church authorities who say he is within his rights to contact police. Instead, Father James decides to keep the threat private and interact with parishioners as normal. He also spends a good deal of time with his daughter, who he fathered before joining the priesthood (Kelly Reilly). Gleeson is a great actor, and he is outstanding in this role, playing Father James as a devout-but-practical man who speaks his mind to believers and non-believers alike. There seem to be an inordinate number of the latter in the small, Irish town where he practices because James spends most of his time interacting with people who openly scorn his beliefs. Although “Calvary” is an intriguing film there are things – including the multitude of skeptics – that ring false. While it’s true that many doubt the beliefs of the Catholic Church, it seems unlikely that a man of the cloth would actively seek them out for confrontation … as James repeatedly does. This is especially true since Gleeson portrays the character so sensibly in other respects. The movie’s final act, while undeniably powerful, also seems questionable in relation to what viewers have learned about the assorted characters. It seems almost as though McDonagh was determined to make his film as bleak as possible, regardless of whether it meant a break with reality. Although Gleeson carries the movie, it also features solid performances by the supporting cast, including Reilly, Chris O’Dowd, Aidan Gillen and M. Emmet Walsh. Ultimately, that’s what makes the feature palatable, as the acting largely redeems the questionable plot points. The DVD release has no extras, but the Blu-ray contains several making-of features. “Frank”: Independent dramedy about developing tensions in a rock band led by a musician (Michael Fassbender) who always performs while wearing a huge fake head. Maggie Gyllenhaal and Domhnall Gleeson also star. Directed by Lenny Abrahamson. “Doctor Who” – The Complete Eighth Series: Twelve episodes from the latest incarnation of legendary science-fiction character Dr. Who. This time the Doctor is portrayed by Peter Capaldi. “Under the Dome” – Season 2: The TV adaptation of Stephen King’s bestselling novel about a small town trapped beneath an invisible dome is a treat. This set includes the 13 latest episodes. “Safe”: Criterion Collection restoration of writer-director Todd Haynes’ 1995 drama about a suburban housewife (Julianne Moore) who believes she has developed a dangerous sensitivity to everyday chemicals. “Time Bandits”: Fresh transfer of director Terry Gilliam’s 1981 film about a youth (Craig Warnock) who embarks on wild adventures with a group of time-traveling dwarves. Ralph Richardson, Sean Connery and David Warner also star. “The Night Porter”: Restoration of writer-director Liliana Cavani’s dark drama about a Holocaust survivor (Charlotte Rampling) who resumes a sexual relationship with the Nazi officer (Dirk Bogarde) who took advantage of her during the war. Yes. It’s been a good year for movies all-around!